The SCHR brochure about how the European Court of Human Rights (ECHR) protects businesses uses key case studies to illustrate which of the guarantees contained in the European Convention on Human Rights are particularly relevant to companies. According to the legal precedent set by the ECHR. businesses, as well as individuals, can invoke important rights that are laid down in the Convention. For example, freedom of expression, as described in Art. 10 of the Convention, also applies to advertising. The right to privacy enshrined in Art. 8 of the Convention also extends to business premises and business records. In addition, businesses benefit from the right to a fair trial, in accordance with Art. 6 of the Convention. 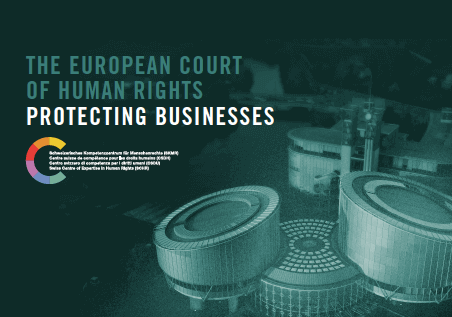 "The European Court of Human Rights – Protecting Businesses" forms part of a series of brochures on the importance of human rights to selected professional groups and areas of life.